Auto ads being a new medium draws curiosity and grabs attention. Auto ads stands out from the clutter of posters, hoardings, banners. Auto Rickshaw Branding lights up at night..... `Brightly`. Auto Advertisement has more Durability. Auto Advertisement gives more option of space to advertise and it can easily provide more information about product to consumers. Auto Rickshaw branding is very elegant and attractive. High per local advertising. Auto Advertisement has a very low cost per eyeball ratio. Auto Advertisement moves with the crowd catering to vehicular, pedestrian and local transport passengers all at once. 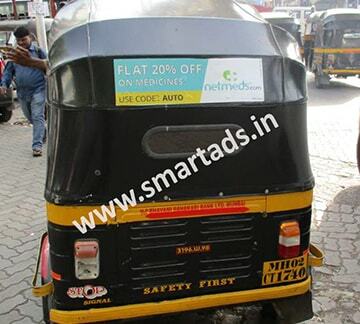 Auto rickshaw advertising is revolutionize the way companies advertised their products & services. Auto rickshaw advertising is a popular and effective marketing technique. It is the most affordable outdoor medium which helps to catch maximum eyeballs. Auto ads reaches even those areas where other vehicles cannot reach. 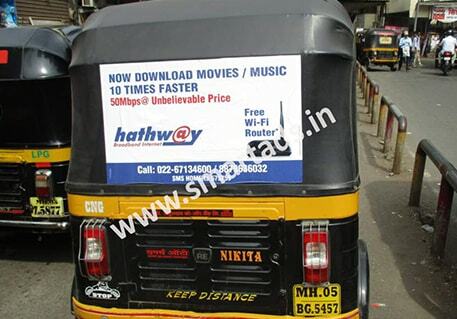 Rickshaw advertising is a new and smart way of advertising. Auto rickshaw branding ensuring maximum visibility for your brand. The best feature is that the entire traffic conspires to become your captive audience, especially at traffic junctions where people need something to read till signal light turns to green! Hoardings advertising is costly and static, an auto travels to every nook & corner of the city. Rickshaw carry your brand to different places! Auto rickshaw branding became the new hub for advertisers. If compared with the range of audience it covers, it`s the most feasible and innovative mode to outdoor advertise. Auto rickshaw branding can be done on rickshaw hood, rickshaw meter cover, rickshaw rain cover & back seat of auto rickshaw driver. Auto Rickshaw Advertising in Mumbai. Auto Rickshaw Advertising in Delhi. Auto Rickshaw Advertising in Kolkata. Auto Rickshaw Advertising in Bangalore. Auto Rickshaw Advertising in Ahemdabad. Auto Rickshaw Advertising in Surat. Auto Rickshaw Advertising in Pune.